THE country abounds in many relics of the past, and among the more antiquated ones is the Indian Railways. While the world has sped its way to the 21st century, it has trundled along at a leisurely pace, smugly existing in the previous century. THE Planning Commission affidavit submitted in the Supreme Court on Tuesday says anyone able to spend more than Rs 32 in a city and Rs 26 in a village daily on basic necessities is not poor. Accordingly, it has put the number of poor in India at 40.74 crore. The commission has reached this figure employing the Suresh Tendulkar Committee formula used to estimate poverty based on the 2004-05 prices. THE assassination of former Afghanistan President Burhanuddin Rabbani in Kabul’s “Green Zone” on Tuesday is a major setback to the efforts for peace through negotiations. SOME time ago Finance Minister Pranab Mukherjee was visibly happy at the pace of industrial growth, which was up at 8.8 per cent for the month of June. The industrial sector comprises 25 per cent of the total production in the country and is the key driver of GDP growth. If industrial growth slackens in a significant manner then the GDP increase will also falter, whereas high industrial growth in the next few months may guarantee an 8 or 9 per cent rise in the GDP. I had been most certain that it was the nightingale. Working in the home office during the day and sometimes late into the night, I was regaled by the most melodious song of a bird. NATURE has compensated hill states with vast hydropower potential in lieu of the sound agricultural system that is available in the plains. If Arabs have oil, Himalayan states in India have the hydropower wealth. Now, it entirely depends upon the ingenuity of the state concerned how expeditiously it mines/milks its treasure trove. THE country abounds in many relics of the past, and among the more antiquated ones is the Indian Railways. While the world has sped its way to the 21st century, it has trundled along at a leisurely pace, smugly existing in the previous century. At last, the government has woken up to the need of modernising the behemoth and has chosen technocrat Sam Pitroda to head a high-profile committee, which will suggest ways to modernise its tracks, signalling system, rolling stocks, stations and other projects. Mr Pitroda has the right credentials, considering that he transformed the country’s telecom scene two decades ago by making STD facility available across the length and breadth of the country. The panel, which also includes HDFC Chairman Deepak Parekh and former SBI chairman Maya Verma, will concentrate on using information technology for improving efficiency and safety, augmenting existing capacities of the railways through indigenous development, reviewing projects and addressing the public-private partnership. One hopes the wise men are able to compensate for the tragedy of drift which was too obvious during the time of previous railway ministers like Ms Mamata Banrjee and Mr Lalu Yadav. Safety and modernisation are indeed paramount necessities that brook no delay. How to finance these is another big question. The Railway Ministry has already expressed its limitations. It has exhorted the government to declare some projects as national projects, with the money coming from the Centre. Then there is the talk of taking the help of the private sector for modernisation of stations and other projects. The government just has to show the will to do so. One hopes the recommendations of this committee and that of another one constituted last week under former Atomic Energy Commission chairman Anil Kakodkar on safety will be implemented with the alacrity that these deserve. THE Planning Commission affidavit submitted in the Supreme Court on Tuesday says anyone able to spend more than Rs 32 in a city and Rs 26 in a village daily on basic necessities is not poor. Accordingly, it has put the number of poor in India at 40.74 crore. The commission has reached this figure employing the Suresh Tendulkar Committee formula used to estimate poverty based on the 2004-05 prices. Earlier, poverty was measured on the calorie consumption criterion. Tendulkar abandoned this practice and calculated the daily spending on food, health and education to assess poverty. To say that a villager who spends Rs 27 a day on food, health and education is not poor is bound to raise howls of protest – and justly so. What about shelter? Experts engaged in an academic study of poverty might not have anticipated extreme public and political reactions to the definition of poverty. The BJP and TV channels lost no time in targeting the Planning Commission, which was also at the receiving end for skirting the Supreme Court’s query: why is there a cap on the number of people living below the poverty line? Instead of a direct reply, the commission sought to give poverty estimates. No one denies that acute poverty prevails in India. Given the widespread malnourishment and lack of access to basic human needs like clean drinking water and toilets, the government and its think tank have marked a cut-off line — which is disputable, no doubt — to determine who should get subsidised food. The proposed law on the right to food is set to impose huge costs on the government, whose finances are already overstretched. Hence, there is a ceiling to limit entitlements. The focus of debate should be on how best to make subsidies available to the needy without systemic leakages. Electronic cash payments and food stamps are being considered to replace the discredited public distribution system. To banish poverty in the long run, there is no alternative to fast growth and a fair distribution of the fruits of growth. THE assassination of former Afghanistan President Burhanuddin Rabbani in Kabul’s “Green Zone” on Tuesday is a major setback to the efforts for peace through negotiations. The 71-year-old head of the High Peace Council, appointed a year ago by President Hamid Karzai, was working hard to broker peace between various Taliban factions and the government in Kabul. The US-backed idea was to convince the Taliban to abandon the path of violence, join the government and get engaged in the reconstruction of Afghanistan. This was acceptable to some Taliban groups, which had been sending positive feelers to the Karzai government. The US and its Western allies believed that a viable administration in Kabul was possible with these “good” Taliban on board. The “bad” Taliban, who were not ready to accept the conciliatory idea, could be eliminated till the scheduled Western troop withdrawal in 2014. But the strategy is unlikely to work with Rabbani’s elimination from the scene. The Haqqani Taliban faction, which is believed to be behind the assassination of Rabbani, has its own calculations like the group led by Mullah Omar, who headed the infamous Taliban regime that was overthrown by the Northern Alliance with the assistance of the US-led Western coalition after 9/11. The “bad” Taliban see an opportunity to come back to power on their own in the absence of Western troops in Afghanistan. There appears to be another reason why Rabbani has been eliminated in a suicide bomb attack. He was an ethnic Tajik and headed the government before the Taliban, composed of Pashtun extremists, took over the administration in Kabul in 1996. Even the “good” Taliban who had been cooperating with him suspected his motive. His absence from the scene is very demoralising for President Karzai as well as his Western backers. Hardly a week before the killing of Rabbani, the Taliban had dented the US claim that the militant movement had been weakened and that the Afghan security forces were in a position to maintain law and order in their country without any outside help. It seems there is need for a new strategy for ensuring stability in the war-torn country. SOME time ago Finance Minister Pranab Mukherjee was visibly happy at the pace of industrial growth, which was up at 8.8 per cent for the month of June. The industrial sector comprises 25 per cent of the total production in the country and is the key driver of GDP growth. If industrial growth slackens in a significant manner then the GDP increase will also falter, whereas high industrial growth in the next few months may guarantee an 8 or 9 per cent rise in the GDP. The industrial slowdown in July to 3.3 per cent has clearly disappointed the government. Growth of the manufacturing sector in particular has slowed down considerably to 2.3 per cent. Inflation is contributing in small measure to the slowdown of industrial growth because the input costs of manufacturing companies are going up. And, on the other hand, demand is slowing down due to less money in the pockets of the ordinary people after meeting their high food and fuel bill. Many of the problems that we are facing today are also due to the fact that India has got globalised and is closely linked with Western markets. If the US and the European Union are undergoing an economic slowdown, IT software, textiles, garments, handicrafts, leather products, gems and jewellery exports will suffer a setback. Exports, however, grew by 82 per cent in July but have slipped in August to 44 per cent. Around 60 per cent of India’s software exports are going to the US, amounting to $59 billion. A slowdown in the US demand will cause job losses in our IT industry and this will have an impact on the consumer goods market because the young, highly paid IT sector employees have been important buyers of consumer goods and luxury goods. They have boosted the real estate sector also. There is clear evidence that the US economy is facing a pale economic recovery combined with a high unemployment rate and the EU zone is battling an economic crisis due to Greece’s debt problem and the possibility of a default. The impact of the US and EU economic slowdown is already being felt in the real estate sector. This is relating to a slowdown in the demand for office space and residential apartments by multinational companies, which contributed to the real estate boom in the past. Some companies may even be closing down their offices in the future. As a result of slower construction activity, the real estate sector has grown only by 1.2 per cent as compared to 5.7 per cent in the first quarter last year. Many developers are facing problems in completing their projects due to high interest rates. Many are selling half-finished properties to recover their money. A slump in real estate will mean fewer jobs for construction workers and less demand for construction materials. The gloomy global scenario has affected Indian companies’ borrowings abroad and it has been impacting their investment outlook. In the recent past, because of the much lower interest rates in the US and the EU, Indian companies had been borrowing abroad to pay back creditors and for business expansion but due to the ongoing recession, foreign sources have been drying up. Recently the Reserve Bank of India had relaxed the ECB (External Commercial Borrowing) guidelines, enabling companies to borrow more from abroad, but this has not helped. The government recently allowed Indian companies to borrow in the yuan up to $1 billion which could be considered a good development. The demand for dollars from Indian companies and importers in the domestic market pushed the rupee to a new low of Rs 48 to a dollar recently. This would have helped exports, but the rupee is already sliding up with the latest announcement of yet another repo rate hike (by 25 basis points) which will mean higher interest rates and attract more foreign inflows. But seeing the weak markets abroad due to the downgrading of US treasury bonds by Standard & Poor’s, several Indian financial institutions, including the Rural Electrification Corporation, the Industrial Development Bank, the Bank of India and the Indian Bank, have already postponed their overseas offerings. Thus, efforts for raising money abroad for business expansion have remained constrained. Clearly, the problems surfacing both in international and domestic markets have eroded the investment confidence of India Inc. The recent data show that all industrial sectors except for electricity production have slowed down. While car sales plunged by 10 per cent in August 2011, sales of consumer goods and consumer durables have remained positive. There was 8.6 per cent growth in consumer durables like fridges, ACs, TV sets, washing machines, etc, which was a huge improvement from June 2011 when it was only 1.5 per cent. Growth in non-durables increased by 4.1 per cent. Only the production of intermediate goods contracted while that of basic goods (steel castings, aluminium, stainless steel, etc) grew by 10.1 per cent. The biggest decline has been in capital goods production, which signifies a slowdown in investment and will affect future industrial growth. The recent hike in interest rates will adversely impact the production of consumer durables and in the construction industry and this will also have an adverse impact on small and medium scale enterprises’ production and their expansion plans. All EMIs will go up, and for the ordinary middle class person the hike in the prices of petroleum products will mean disaster for their budgets. The main reason for worry is that if industrial production does not pick up for the month of August, it is almost certain that GDP growth will not touch 8 per cent and will be around 6 to7 per cent only this year. It has already declined to 7.7 per cent in the last quarter. While 6 to 7 per cent may be a good growth rate for a small country but India faces the problem of providing jobs to its youth and the main impact of a slowdown will be on employment growth. Around 12 million youth are expected to join the labour force every year. Where will they find jobs if there is a marked slowdown in manufacturing, mining and service industries? Fortunately agriculture has been growing well at 3.9 per cent, otherwise there would be more job seekers migrating from villages to towns in the near future. The combination of high food inflation and general inflation, which was up at 9.78 per cent recently, and lack of sufficient job opportunities due to slow growth in the manufacturing sector in particular can spell disaster for a highly populated country like India. The government has a tough task ahead of controlling inflation and providing jobs for all in the future for its own stability and for the internal security of the country. I had been smiling at the thought of the nightingale coming into my life with her song only to have a friend confirm that there were no nightingales in our part of the world and that it is perhaps another singing bird that I have been hearing, maybe a lark. I can only wish it were the nightingale because the nightingale will always be an unmistakable part of my consciousness thanks to two beautiful ladies, the first being my mother. Mom wrote her M. Phil dissertation on the Romantics while she was nursing me and her favourite was the iconic young poet, John Keats. In later years, she beat it into me that I had a natural affinity for literature due to my infant connection and it needed to be nurtured. To make gains in that direction, for school recitations, she picked out one or the other poem by Keats for me to recite. I started out with the shorter ones like “La Belle Dame Sans Merci” and moved on to “Ode to Psyche” and later “Ode to autumn.” And as I recited with the uneasy, awkward intensity of a 13-or-14 year old, it made mom very happy. And as you may have guessed by now, all along, I was being geared towards reciting the masterpiece, “Ode to a Nightingale.” Well, I resisted that due to the ode’s enormous length and declared flat out that there was no way that I was going to memorise that huge length of poetry. I could only maintain that stand until the spring that I entered high school and the second unforgettable lady stepped in. Well, to escape the nastiness and due to obvious pressure from mom, but most of all because I cared very deeply for the feelings of both, I relented. So there I was on the day of the high school recitation, reciting the laboriously memorized eight long stanzas. On seeing me win both applause and award that day, the eyes of both the ladies lit up with a joy that they reserve for rare moments while I choose to behave nonchalant. At 17, that seemed like the cool thing to do. It was many years later, when I began teaching university and later still on becoming a parent that I too have experienced those glimmering eyes upon seeing a student outdo himself and upon seeing my kid score a goal! While Uttaranchal is a laggard in this respect, Himachal Pradesh leads all other states in discovering its real wealth. Though late it’s now in the midst of a silent revolution for harnessing the total hydroelectric power potential by 2020 and may become the first hydropower state of India. The Himachal Pradesh Power Department, with the help of the Himachal Pradesh State Electricity Board Corporation, has done a commendable job of identifying 120 power projects with a capacity 17,000 MW (50 per cent projects would be of 5 to 50 MW) across five river basins of the state. Ninety-five per cent projects are run-off-the-river (RoR) type and are located across the rivers Sutlej, Beas, Ravi, Chenab, Pabbar (a tributary of Yamuna) and their tributaries. In a run-off-the-river project, a weir/barrage is constructed across the river and the flow is diverted through a long straight RCC-lined tunnel at a slope gentler than that of the river, so that the end of the tunnel reaches a far higher elevation than the bed of the river. This level difference is utilised to lead the flow to the turbines of the powerhouse to generate electricity. This system faces two inherent deficiencies. Firstly, the rivers in northern states carry very high discharge during the monsoon season and very low flows during the remaining nine months of the year. Accordingly, the powerhouse does not get full supply of water round the year and the installed capacity remains under-utilised for three quarters to bring the average capacity utilisation to 45 per cent (It’s 95 per cent in case of the Brahmaputra basin). The power producer, therefore, stores the low flow for 18 hours at the barrage and runs the power plant for six hours per day during the peak demand hours. Secondly, in the absence of a storage dam, the silt in the flowing water during rainy season is not entrapped and quite often the concentration goes very high. Once it exceeds 5,000 PPM, the powerhouse has to be closed to prevent damage to turbine blades/runners. Then, one day's closure of a 500 MW power plant causes a generation loss of 120 lakh units or a revenue loss of about Rs 5 crore during the monsoon. In order to offset these two deficiencies, it is essential that one or two storage dams, e.g., the Khab project across the Satluj River, are constructed in the upstream reaches of the river to entrap silt and store flood water during high flow season to be released later during the lean flow period to increase the power generation of all downstream projects by at least 30 per cent. The storage dam also prevents floods particularly in the Satluj River, where these have been attributed to release of water from the Parchu Lake in China. However, the states have to think wisely before embarking upon the construction of a storage dam these days, because it leads to the submergence of vast forest lands besides causing displacement of large number of families. Dislocation and rehabilitation of communities at locations nearby or elsewhere is a herculean task. Although the density of population and forest trees are minimum at higher altitudes, the perceived risks are highly exaggerated by vocal activists to serve their own selfish ends. In such a scenario, obtaining environment and forest clearances from the Ministry of Environment and Forests (MoEF) and other agencies has become a big challenge. 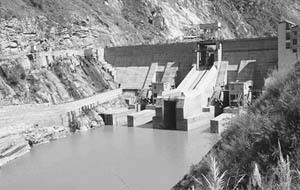 Big projects like the Bhakra Dam were cleared in good old days and their approvals were not possible in the present times of social, environmental and political activism. But it is hoped that the state will go in for the construction of some storage dams for aforesaid purpose once all the RoR projects are complete and become operational. Out of 120 projects, at least 70 per cent have been allotted and these are under different stages of execution. Remaining 30 per cent projects (with a combined capacity of about 5000 MW) will be allotted soon. These projects have been initiated both by private and public sector players (SVJN, NTPC, NHPC, HPPCL, HPSEB) almost in equal proportion. Jai Parkash Associates has already started the trial run of its 1000 MW Karcham-Wangtoo project across the Satluj River. (The project has cost the company Rs 7,920 crore or Rs 8 crore per MW). As such, by 2020, Himachal Pradesh will have an additional power generation of 17,000 MW (7650 MW for 24x7 power generation) and earn good revenue. Certain roadblocks, however, are delaying the execution of these projects and accordingly require the attention of both the Centre and the state. Firstly, since some of the projects are located at very faraway places in the Lahaul and Spiti region, the government should build two-three airports for 50-seater planes. In the absence of traffic tunnels, vehicles have to move three times the aerial distance along circuitous roads. Also, some of the important roads have been badly damaged due to rains and need immediate repairs and resurfacing. The agencies concerned (state, BRO and NHAI) should start a massive programme of rebuilding the roads with cut-off tunnels at important bends to reduce distances. All hydropower project sites should be made accessible with good bituminous roads before the start of the projects. For future prosperity of the state, the tunnel rail projects should be taken up urgently, because they will reduce the distances between important towns to one third. Then, Shimla will be only 35 km away from Kalka and an electric train will be able to take one there within an hour. Tunnel rails are urgently required here for defence purposes as well. Secondly, the MoEF should further decentralise its powers to the State Environment Authority (from current 50 MW to 200 MW) for granting clearances for quick financial closure of the projects, as all projects are of identical nature and format. Similarly, for forest clearance, the power of the regional offices of the MoEF needs to be enhanced from five to 50 hectares. Thirdly, at many places, certain mischievous elements with ulterior motives misguide and mobilise the local people to oppose/stall the construction of projects on flimsy grounds. The state authorities need to deal such undesirable elements with a firm hand. The state also needs to launch a strong awareness campaign to familiarise people with the necessity of early execution of hydropower projects for the prosperity of the hill state. If the state disburses a fraction of the revenue earned from these projects directly to the affected families in the form of monthly pensions or shares, people may demand early allotment of power projects in their constituencies like they do for new roads and hospitals. With these measures taken, the dream of commissioning 120 projects by 2020 can be fulfilled well in time and Himachal Pradesh will become another Switzerland in India. In fact, it is high time for the states of Punjab, Haryana, Rajasthan and Uttar Pradesh to bag some of these projects through direct negotiations with the Himachal Pradesh government after fulfilling the royalty parameters. R. N. Malik is former Engineer-in-Chief, Public Health Haryana. V. K. Tiwari is Head, Environment Wing, HPPCL, Shimla. These are their personal views. THE hydropower potential of the state is likely to go up to 25,000 MW from the existing 23,000 MW after the completion of the exercise underway to prepare digitised basin-wise plans to help identify additional potential. So far projects with aggregate capacity of 7,728 MW have been commissioned and the plan is to exploit the entire potential by the end of the 12th Plan (2022). 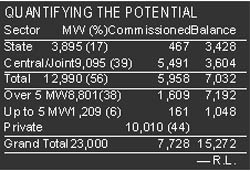 The target for the 10th Plan is 2090 MW, 11th plan 9155 MW and 12th plan 5027 MW. Ironically, only 467 MW, just 6 per cent of the total potential exploited, has been harnessed in the state sector. With most for the projects allotted to the private sector, even after exploiting, the total potential the state sector projects will account for just 17 per cent. Considered a clean and green source of energy until recently, the hydroelectric projects are being vehemently opposed by local people and even environmentalists have been voicing their concern over the fallout of impounding of rivers and ruthless tunnelling of hills and large-scale deforestation and drying up of water sources. The environmental fall-out apart, over-exploitation of the hydropower potential will have long-term implications on the lives and livelihood of the local people, as the main rivers will virtually disappear from the scene. If all planned projects on the Sutlej River come up, the 230-km stretch from Khab to Koldam will mostly flow through tunnels. While the 1500 MW Nathpa Jhakri project has a 27.4-km-long headrace tunnel, a much longer 38-km twin tunnel has been planned for the 775 MW Luhri project. The recently commissioned 1,000 MW Karcham-Wangtu Project has a 17.2-km-long tunnel, while the shortest tunnel of 12 km is for the 412 MW Rampur project which is virtually the second stage of the Nathpa-Jhakri project. Similarly, the five other proposed projects will have 18- to 25-km-long tunnels, ensuring that more than 170 km length of the river would disappear. The cascade of 450 small projects, coming up one over the other, will spell doom for the people whose life is hinged to small streams, as these cater to their needs for drinking water and irrigation and the village funeral grounds are also located on their banks. They are not dependent on the main rivers as villages are mostly located in higher altitudes. The projects are being executed in a totally unplanned manner and if all of them are allowed to come up, some streams like the Neogli Khad in Shimla will have eight projects and the Chanju Nullah in the ecologically fragile Chamba will have five projects. In contrast in countries like Sweden, 20 per cent of the hydropower potential has been left unexploited to protect the environment. The impact of climate change is also likely to take its toll. The melting of glaciers, erratic and inadequate rain and snow, and the ever-declining discharge in rivers and their tributaries have put a big question mark over the future of hydroelectric projects. A judicious approach has to be adopted for sustainable development of hydropower and mitigate long-term impact on life of the people.